This cake will make you as happy as a piggy in a mud bath! Converting carnivores, rejoice! You’re going to hog wild when you try this moist, delicious, luscious vegan chocolate cake! I made this cake for my veterinarian, who is a serious chocoholic and one of the most wonderful people on earth. He provides incredibly compassionate veterinary care to the cats of Project Bay Cat, which is a humane feral cat management program that I co-founded 9 years ago. When I told him I wanted to make him a vegan cake to thank him for his kindness, he cocked his head and looked at me suspiciously, like he was trying to avoid a sucker punch. “If it’s vegan, it’ll be good for me, so that means that it can’t taste good. How could you possibly make it without butter, milk and eggs?” he asked with a far-off and somewhat fearful look in his eyes, probably envisioning a cake made of sawdust and frosted with spackle. The challenge was on and I was determined to knock his socks off. To help overcome his vegan fears, I thought I’d distract him with a cute little pigs-in-a-hot-tub motif. Much to my surprise, I was able to find a vegan version of the KitKat bar to create the siding for the hot tub – the dark chocolate version sold in Canada doesn’t have any animal-based ingredients – bonus! When my vet saw this cake, he laughed out loud, and when he and his lovely wife tried it, they said it was the best chocolate cake they’ve ever had. Give this a try – even without the cute pigs or the hot tub, it’ll still make you smile. It’s super simple and quick to make, and it’s moist, scrumptious and guilt-free! Preheat oven to 350. Oil and flour two 8″ round pan. This is a very moist cake, which makes it somewhat challenging to remove from the pan once baked. So use some parchment paper on the bottom of the pan so the cake will easily pop out when done. In a medium bowl, mix all the dry ingredients well. Then add all the wet ingredients and stir well. Pour into baking pans and bake for about 30 minutes, or until a toothpick comes out clean. Cool completely, run a knife around the edge of the pan and invert onto wax paper or parchment. In a high-sided mixing bowl, stir together the powdered sugar and cocoa. Add all the remaining ingredients, and using an electric beater, mix on low speed for one minute, scraping sides of bowl. Then mix on high for another minute or two until the frosting is light and fluffy. I went for a smaller hot tub, so I cut off about an inch around the perimeter of the cakes. Place one cake in the middle of a plate and spread a thin layer of frosting on top. Then place the second cake on top. 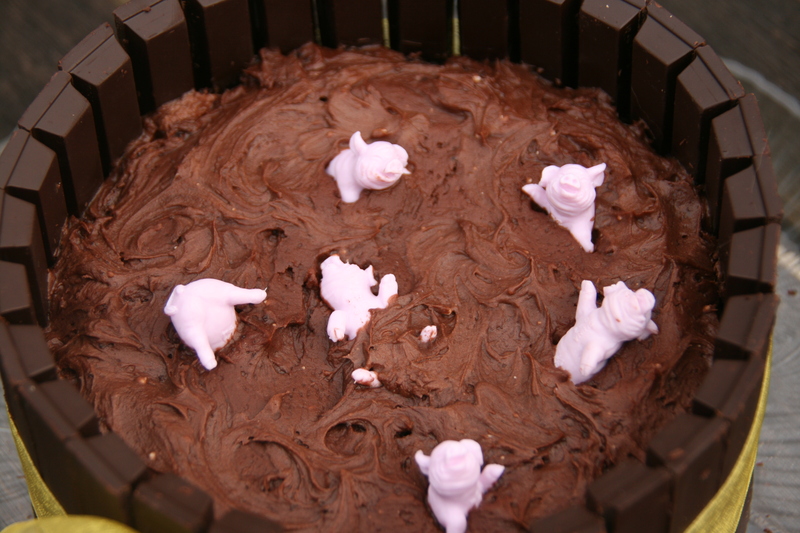 Spread some frosting on top and place your piggies in the ‘mud puddle.’ Frost the sides of the cake generously as this will act as the glue to hold up the KitKat bar siding. Carefully place the KitKat bars shoulder to shoulder, with the unmarked side facing out. To make them even more uniform, gently tie a wide-banded ribbon around the lower section of the hot tub. Then serve and listen to your friends and family squeal when they see this delicious vegan treat! Wow!!! That looks amazing. Is Canada the only place to find vegan kit kat bars? I would love to find some here in the US. I haven’t seen your posts in a while, it’s nice to see you posting regularly again – you posts were really a delight for me in my early WordPress days and I’m glad to see them again! This cake for example looks and sounds mouth watering! Thanks DapperDolly! I’m not sure why, but for some reason many of my followers haven’t been getting my posts in their emails for a couple of months. Hopefully WordPress has resolved the issue now. 🙂 Looking forward to seeing more of your posts as well!